Apparently insufficient, within less than a month, the Parisians began butchering the horses, with the meat used as you would expect and even the blood collected “for the purposes of making puddings.” By the end of the siege, approximately 65,000 horses were killed and eaten. Within another month, by November 12, 1870, butchered dogs and cats began to appear for sale at the market alongside trays full of dead rats and pigeons. The former pets sold for between 20 and 40 cents per pound, while a nice, fat rat could go for 50. 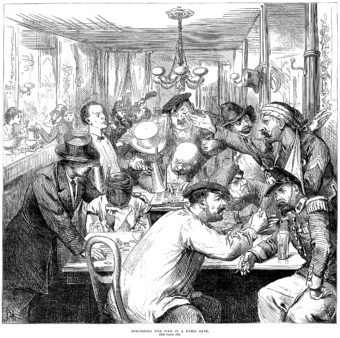 As Christmas approached, most of Paris’ restaurants and cafés were forced to close, although a few of its top eateries continued serving, albeit with a markedly different menu. And as traditional meats were becoming increasingly scarce, the formerly impossible became the actual – when M. Deboos of the Boucherie Anglaise (English Butcher) purchased a pair of zoo elephants, named Castor and Pollux, for 27,000 francs. The enormous animals were killed with explosive, steel tipped bullets fired at close range, chopped up and sold, with the trunks being the most desirable and selling for 40-45 francs per pound, and other parts between 10 and 14. Prized by the fine dining establishments, for its Christmas feat, the Voisin served elephant soup, and for New Year’s Day, Peter’s Restaurant offered filet d’éléphant, sauce Madère. The elephants weren’t the only zoo animals featured on these menus, as the Voison also served kangaroo and antelope, while Peter’s also served peacock. In addition, rats, mules, donkeys, dogs and cats were also transformed by their chefs into roasts, chops, cutlets and ragouts. Ultimately most of the animals in the zoo were eaten, with the voracious Parisians sparing only the monkeys, lions, tigers and hippos. It is thought that the monkeys were left because of their close resemblance to humans, but it isn’t clear why the lions, tigers, and hippos escaped the menu. In any event, the siege was ended by a 23-night bombardment campaign in January, in which the Prussians lobbed 12,000 shells into the city, killing and wounding around 400 people. The Franco-Prussian War officially ended with the Treaty of Frankfurt on May 10, 1871.